All my forex charts (n=12) do NOT have any data for Monday, Tuesday and today. There is data for Wednesday however. Does anyone know how I resolve this issue. Thanks. Who are you connected to? This is displayed in green on lower left corner of the Control Center window. Do you receive an error on screen? Are there errors on the Log tab of the Control Center? If so, what do these errors report? 3. Errors in Log: Unable to connect to NinjaTrader data server (HDS20 NinjaTrader.com/31654). A connection attempt ….. I have the same problem. It is a problem from FXCM. My other datafeeds (Futures) are working. Deleting db (Day/Minute/Tick), log or trace is not helping. Access to historical data from FXCM is currently unavailable. We are investigating the cause and working to restore service. Until service is restored, NinjaTrader 7 can use FXCM's native historical data service. Please follow the steps below to connect to FXCM’s historical data service. We will update this advisory once service is restored. Note: NinjaTrader 8 users are not impacted and no changes are necessary. Disconnect your FXCM connection if currently connected. 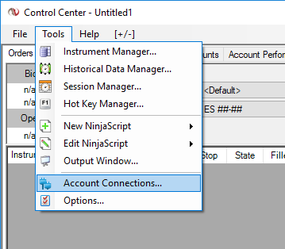 In the NinjaTrader ‘Control Center’ please select ‘Tools’ > ‘Account Connections…’. 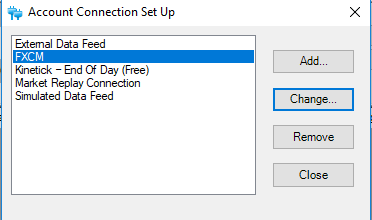 Select your FXCM connection and press ‘Change’. 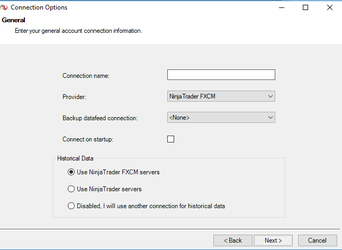 Select ‘Next >’ and then change the Historical Data option from ‘Use NinjaTrader servers’ to ‘Use NinjaTrader FXCM servers’. Continue selecting ‘Next >’ to finalize the settings. Reconnect to your FXCM connection, you will now be using FXCM native historical data servers.